MYSTERY, MUSIC, AND MAGIC were the ingredients of the first Light Up Lantern Festival in Akron. That’s where Hey Mavis singer and songwriter Laurie Michelle Caner first met Leandra Drumm, who organized the seminal celebration of the arts in 2009. Caner became enamored with Drumm’s whimsical style which infused the event, while Drumm fell in love with the band’s free-flowing folk sound. It also turns out they lived a block from each other in Highland Square, which cemented the friendship. Fast-forward to 2016 when Caner, her husband Eddie, and three kids have since moved to a sprawling house on the Cuyahoga River in Kent. Hey Mavis had also won a Knight Arts Challenge grant to create a CD of original songs telling the story of Ohio’s canal days. 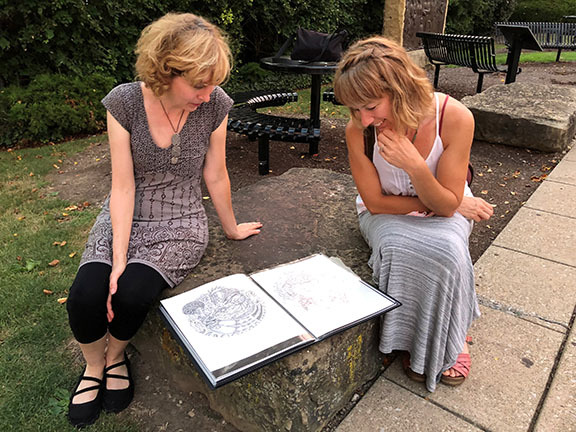 Caner, of course, turned to her old neighbor and friend Leandra Drumm to illustrate the companion book, Silver Ribbon Dream – Songs and Stories of the Ohio and Erie Canal, which debuts this month. “We’re both story tellers,” says Caner, “Leandra tells a story visually and I tell a story lyrically.” And the story of the canal begins with a shovel. “30 Cents” opens the set. It tells the story of the Irish immigrants who did most of the digging of the big ditch that linked the Ohio River to the burgeoning Lake Erie port of Cleveland. The workers earned 30 cents a day and a jigger of whiskey for their labor. “Conditions on the canal were horrible,” says Caner. Malaria, known as “canal fever“, was rampant, adding to the misery of back-breaking work from sunup to sundown six days a week. Still, it was considered a good wage for the migrants, many of whom had done similar work on the recently completed Erie Canal in New York. Drumm’s drawing of “30 Cents'” grim-faced work crew includes a reference to Little Dublin, an Irish work camp in what is now Akron’s North Hill neighborhood. Leandra Drumm says her drawings in Silver Ribbon Dream are influenced as much by the music as by the lyrics. Hey Mavis would send her song sketches as each piece formed in the studio, and Drumm says she listened to each track while working. “My parents are both artists,” says Drumm, whose father Don Drumm is known for his iconic sculptural style, and whose mother Lisa is a fiber artist. Both have influenced her style, she says, especially her mother’s early work with dolls that open to reveal inner surprises. Drumm says this layering of meanings infuses her work on “Silver Ribbon Dream”, drawing the viewer in to become part of the story. Her illustration for “Black Tongue Fever” circles around the sinking figure of a young man at the moment of his death, his face serene and tragic as a priest races to administer last rights. The song centers on the 1827 outbreak of a mysterious disease among canal workers in Akron, an illness doctors still can’t name that eventually turned its victims’ tongues black. Some recovered, but for many it was fatal. “Cures“ ranged from rotgut whiskey to the prayers of traveling priests. “Spent 16 hours in the water digging your own grave…” goes the Hey Mavis tune. looking through Leandra's illustrations for the book. My favorite track is the upbeat “Kitchen Dance” which features the ethereal fiddle of Eddie Caner. 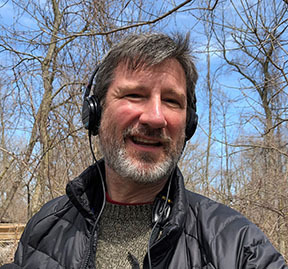 Caner, who also teaches physics at Case Western Reserve University, produced the album, with help from Kent legend David Mayfield. The songs were recorded at Mayfield’s state-of-the-art Sweetside Recording Studio in Canton. Mayfield adds electric guitar and ‘assorted noises’ to a couple of tunes, joining Laurie Caner on lead vocals and banjo, Eddie Caner on fiddle, and Hey Mavis regulars Bryan Thomas on bass and Anthony Taddeo on drums. “This is not being presented as a historically accurate return to the canal era,” says Laurie Caner. “Some canal historians might be annoyed by me,” she says, “but it’s all about the emotions. ”The music often veers far from a traditional folk interpretation of the period. 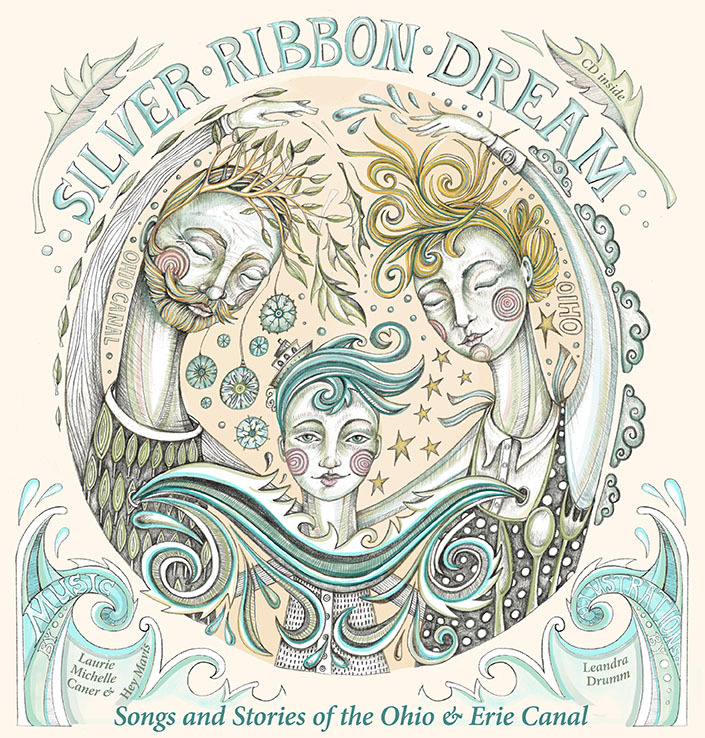 Silver Ribbon Dream brings the stories and emotions of Ohio’s canal days into the 21st century with a fresh sound, but at the same time draws us back to the era’s raw and muddy origins. “I hadn’t heard these stories,” says Drumm, including those of Capt. Pearl Nye, who spent his life along the Ohio & Erie Canal, preserving the songs and lore of the era into the 20th Century. Nye, in a historic recording, can be heard singing a snippet of an 80 verse canal song in the opening to “Dearest Place,” a love song to the self-contained universe that was the canal during its heyday. Generations of people, like Nye, were born, grew-up, and died having never traveled far from its narrow towpath. "Canal people" were their own breed of rough cut frontier folk who rarely interacted with townspeople along the course of their dirty but beloved waterway. One of Nye’s favorite memories is captured in the Hey Mavis tune “Miss Uno,” which tells the story of a snake charmer who traveled up and down the length of the Ohio & Erie Canal in the late 1800s. 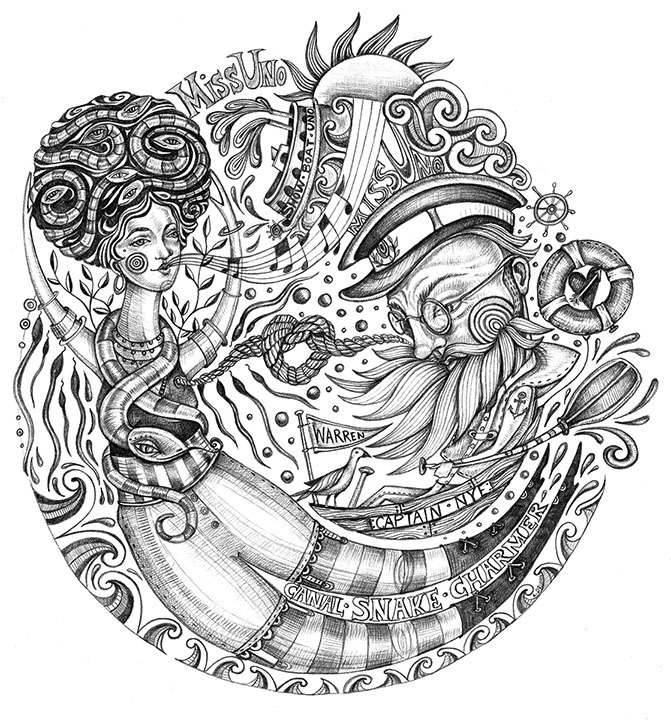 In Leandra Drumm’s drawing, Miss Uno’s blonde locks curl atop her head Medusa-like, flickering forked tongues. Legend has it that Miss Uno earned a living by entertaining canal and townsfolk alike with her trained snakes that would obey the sound of her harmonica. “This woman looked like she could exist in our time,” says Drumm, “with her striped stockings and corset,” and independent lifestyle. The Canal, although only profitable for the 20 years before it was eclipsed by rail in the 1850s and ultimately destroyed by floods in 1913, helped create the Ohio we now know. The cities of Akron, Cleveland, Massillon, Navarre, and a dozen other canal towns grew to prosperity through the commerce generated by the canal. Boatloads of coal from mines in Southeast Ohio headed north to factories in Cleveland. Grain from central Ohio was shipped south to Portsmouth and on to Cincinnati and ports along the "big river". Akron especially owed its early growth to the canal that flowed straight through its center, powering its mills and drawing people to its summit. Today, we still have the Towpath Trail linking Akron to Cleveland. We have Lock 3 Live events and Lock 4 concerts in a revitalized downtown. We have remnants of the big ditch and its massive locks preserved in the Cuyahoga Valley National Park, like stone monuments from an earlier age. And we have far-off memories of the lives and livelihoods of those whose toil left its mark across the once vast forests of frontier Ohio. Silver Ribbon Dream tells their stories and reminds us that nothing is truly permanent and that nothing is ever truly lost.